i'm happy to report i managed to make it through the whole night last night without falling out of bed :) once you fall out of bed, it makes you a little paranoid that it's going to keep happening! today's review is on Layla Velvet Effect 07 Lemon Soft, their new line of nail art (kindly provided to me for review!). 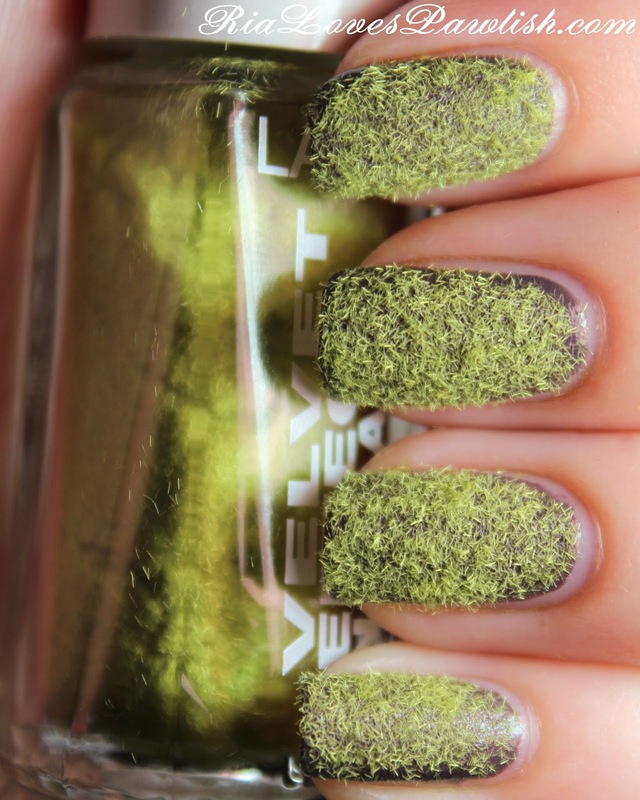 Velvet Effect is texturizing particles that come in a traditional Layla polish bottle. 07 Lemon Soft is lime green and once applied, really reminds me of fiberglass insulation... it's a pretty cool effect! i layered it on top of Layla CE 34 Lavender Mud (also provided for review!) for contrast (especially in swatch photos! ), but i think it would look better over greens and yellows... let me know if you'd like to see it layered over other polishes :) Velvet Effects are easy to apply... you just sprinkle them on the nail while your base polish is still wet, wait for the polish to dry, then brush off the excess particles. it's best to go nail by nail, so that the polish will be as wet as possible and help the particles stick on better! you can also gently press down once you've applied the Velvet Effect, to make sure the particles are really bonding into the polish. your nails will feel soft and fuzzy with this product, not sharp at all. after washing your hands, Velvet Effects dry really quickly... which was something i was concerned about. don't worry, your nails won't feel soggy! here's a bottle shot with the little brush that was provided for me in my sample box! and here's Layla Velvet Effect 07 Lemon Soft over Layla CE 34 Lavender Mud! 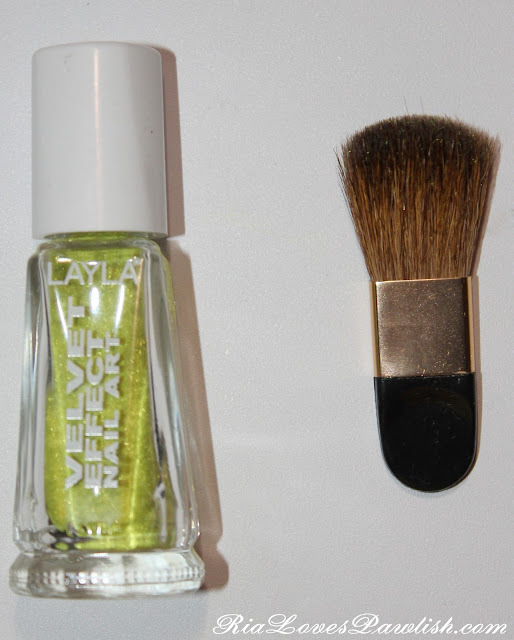 Layla Velvet Effect products are available at Aveyou.com and Zappos.com, retailing for $10.50!